How do you resolve challenging behavior? 1. Watch. 2. Ask. 3. Adapt. • what happened just before the behavior? • what happens after or as a result of the behavior? • do the consequences reward or encourage the behavior? • how are YOU, the caregiver, feeling? • what exactly does the child see? hear? feel? smell? They suggested that teachers carry index cards with them, in order to be more intentional in their note-taking about specific events. Ideally, you will have a colleague/outside observer in, to do the note-taking for you. A brief vignette – we watched a video of a father dropping off his 2 year old child at day care. Every training participant took observation notes on what they saw in the sad, difficult interaction. Then, we shared all the different things we noted. I was fascinated and surprised by how many concrete observations were made by others but not by me – and I consider myself a very good observer. Note to self: even though I am watching the behavior, I don’t see everything. I don’t know it all. • I wonder why was the caregiver so abrupt? I wonder if the caregiver has a lot on her mind? I wonder if the caregiver has a lot to juggle at one time? • I wonder if drop off is always a problem? I wonder if Dad usually drops off? I wonder if it is hard for Dad to leave his child? • I wonder what’s the “take” of the other kids when she cries? I wonder why she had to say goodbye to her Dad away from the other children at the center? • I wonder how long she is sad? • I wonder if there is something that could be changed in the environment? I wonder if you could bring her to a friend before leaving? I wonder if Dad could read her a book, sing her a song? • I wonder if she might be hungry? I wonder if she is tired? • I wonder if something is different at home? Make a plan to change something about the situation, and see if it makes a difference. If it doesn’t improve, try something else. Adapt. What about our daily routines? Here’s something that I hadn’t thought much about before: making use of the basic parts of your day to have a little fun and education with your child. On Saturday morning (3/20/10) at the Addressing Challenging Behavior Conference, I attended a workshop by Dr. Julian Woods entitled “Using Everyday Routines and Activities to Promote Positive Communication and Social Interaction for Children and Caregivers.” Dr. Woods is Director of TaCTICS at Florida State University, an organization that works with families to establish more responsive communication. Whether we are teachers or parents (or both! ), sometimes our days feel like one “must do” after another. What a different spin we can put on it, if we seek to make a more loving, communicative connection with our children during each of these routine, busy times. In the classroom, I try very hard to have a lengthy period of the day for exploration and learning. However, some days, for example, when we have visitors or a special class to attend, or perhaps a fire drill, it feels as if we spend our time coming and going, “lining up,” forcing transitions of the children from one place to another. Have you ever thought of seizing these routine times as the opportunities they are for the children to have a positive interaction with you? This is the thinking behind following your child’s lead in play – the child shows what he/she is interested in and you play along, echoing and engaging in the fun, too. Routines are different from child's play because the child usually does not independently choose to do them. (Though I have fond memories of my youngest grabbing the broom after dinner, to sweep the kitchen. . . unfortunately, he gave that up after about age four). This workshop showed how there is still much we can do to promote positive communication, to help a child’s language and communication skills grow - even if the only thing your child is doing is following your crazy schedule. Two basic things that are important to a child’s learning are available in abundance in our daily "must do's": a loving relationship with the caregiver and repetition of information. If you are frustrated with some of your daily routines, particularly the way that your child(ren) participate in them, I encourage you to check out the extensive information provided by TaCTICS, an outreach training project funded by a U.S. Department of Education Grant. Dr. Woods and her colleagues work with parents, families, and caregivers to help foster responsive, caring communication in these most basic interactions with children. What to share with teachers about challenging behavior? To some extent, I take these behaviors in stride - I expect them. I know these behaviors are not atypical of this age – particularly in a group of kids this age. You have to expect these kind of challenges from a group of children who are transitioning from “all about me” two year olds into “hey, how do I play with you?” three year olds. I work all year to lessen these challenging behaviors, but I'm not surprised by them. But then I participated in “The Power of Peers: Peer Strategies to Support Appropriate Behavior and Social Development” - an excellent workshop by Phil Strain and Ted Povey of the University of Colorado at Denver’s Positive Early Learning Experience (PELE) Center. (I knew I was onto something fun and invigorating when the workshop began with "I’m Just Waiting on A Friend,” by the Rolling Stones.) PELE is a preschool program involved in long-term intentional studies with autistic children, focusing on social-emotional learning. Phil Strain and Ted Povey explained that having peer-related social skills (having a friend) is the most important, the most relevant, the best predictor of positive, long-term outcomes - meaning, living independently and happily, being employed, recovering from life-threatening illness and living a long life. Peer-related social skills are the foundation upon which all other crucial skills are developed. Their data indicates: friends are the most powerful influence in an individual's life after age 2 - more important than Mom, Dad, Grandma, Grandpa, and Teacher. Children learn most from each other. Phil Strain, Ted Povey, and other colleagues at PELE analyzed the discrete behaviors that go into basic interactions between friends. For the past 20 years, PELE has intentionally taught five social skills to their students (both typical and autistic learners): 1) How to Get Your Friend's Attention, 2) How to Give a Toy, 3) How to Request a Toy, 4) How to Organize Play with Others, 5) How to Give a Compliment. How do you teach these skills? PELE developed "cue cards" on each of these discrete friendship behaviors and then taught them at large group time, repeated them individually to children as needed, posted the cue cards at children's eye level in the classroom, and - most importantly - embedded opportunities to practice each of these behaviors throughout their daily routine. In other words, making sure that the students had plenty of repetition of these targeted skills. We watched several video clips where it was really rather extraordinary to see the children's caring interaction with each other. Isn't this really the environment - the foundation - that we teachers are seeking to create? I realized: it is very possible that each of these behaviors is based in poor social skills. Not knowing. Not understanding. I shouldn't ignore this as "personality" or "temperament" or even "developmental stage," or assume that children will learn organically, from life itself, how to be a friend. Instead, the goal of friendship - breaking it into learnable chunks - should be the primary purpose of the early childhood classroom. Wow! I am having an incredible week! I am in Clearwater, Florida, attending the 7th Annual Addressing Challenging Behavior Conference, put on by the Center for the Social and Emotional Foundations of Early Learning (CSEFEL) and the Technical Assistance Center on Social Emotional Intervention (TACSEI). Each workshop is three hours long - very intensive. Sessions began yesterday; I have attended 4 sessions so far and my head is full (and hurting!) with great information. Tomorrow morning, I will attend my last session and head back to Silver Spring, Maryland...ready to put lots of this info to work! I will use this blog for the next several entries to share my "take away" from this fantastic training about Challenging Behavior in Preschoolers. One thing this CSEFEL/TACSEI conference has made clear - there are a lot of remarkable people in this field, doing a lot of provocative and interesting research. Why is dramatic play educational? I just attended a fantastic training by Victoria Brown of the Lucy School on the "Dramatic Difference in the Preschool Classroom," at the Potomac Association of Cooperative Teachers' Spring Conference. This training was a refresher for me, having participated in some 15 hours of Lucy School training back in 2006-07. Several of my colleagues have participated in the Lucy School's week-long summer training institute on using drama and the arts in education - an experience I highly recommend! Children emerge as communicators, problem solvers and humanitarians through holistic experiences. The arts provide a unique multi-dimensional medium for early learning. Drama, movement, dance, music and visual arts communicate to young children in their own language - the language of make-believe. Their curiosity is stirred, questions arise, ideas are shared, and language is expanded and practiced. What's more, when children participate in creative arts activities infused with literacy, their interest in and awareness of reading and reading-related activities increase. Today, Victoria Brown was teaching some 100 teachers how to use drama in their preschool classrooms. She used the story Where the Wild Things Are by Maurice Sendak and showed us, scene by scene, how we could dramatize this book with children. We teachers had such a good time! It was quite a sight to see all of us sailing on an ocean journey, creating birds, alligators, and whales with a simple piece of paper ("object transformation" - to do this, children must encode/decode, which is a necessary step in pre-literacy). There were many laughs as we collectively danced the wild things' rumpus, jumping on bubble wrap like happy, young children. We vigorously shouted "I'll eat you up!," as Max did, and then immediately returned to our normal selves. (Imagine the thrill children must have, being the protagonist - especially, such a naughty one!). • it provides a fun starting point for talking and exploring subjects (such as, in Where the Wild Things Are, exploring feelings of disappointment, anger, being out of control, and even forgiveness). • Be careful to distinguish between your teacher’s voice and any character you might play – and, vice versa, have a signal for the children to know when they are in character or not. • Try to make the scenes multi-sensory, with sight, sound, and tactile experiences. • Consider having the children keep a drama journal – allowing them to write or draw in response to a performed scene. 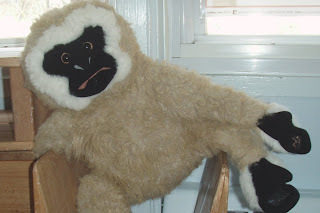 • Develop a drama “trunk” or closet, to have basic extras at the ready, including fabrics, yarns/ribbons, CDs with nature sounds, and even basic recyclables such as paper towel rolls that could be transformed into magical objects in a drama. All the specific lesson ideas and strategies that we saw today are described in detail in Victoria Brown and Sarah Pleydell's book The Dramatic Difference: Drama in the Preschool and Kindergarten Classroom. Drama is an intrinsic part of the Lucy School program, and the children work through stories over many days and even weeks. This school year, they worked through a remarkable original drama about Pakistan, based on Listen to the Wind: The Story of Dr. Greg and Three Cups of Tea by Greg Mortensen. Those of us at the training saw fabulous photos of this creative endeavor. It was truly remarkable to see small children engaged in an intensive, long-term effort on such a mature theme, leaving me no doubt that there is tremendous value in dramatic play for children. Check out the Lucy School website for more information! Enjoy! I suspect this blog will have many, many entries about "frisky friends" - it is a subject that is dear to my heart. My interest in frisky friends and learning differences in children goes way back – probably back to my own childhood, and watching one of my brothers get reprimanded time and again for knocking the drinks over at the dinner table, tripping over things, breaking things by accident, running through the house. And then I had my own children, three boys and many energetic days together. The next thing I knew, I was teaching preschoolers - trying to “contain” these “frisky friends” in my classroom, especially during circle time. How are you supposed to teach? It is not for the faint of heart! • to be very, very active – running, climbing, jumping, moving constantly. All of the above are very likely if the child is a kinesthetic, tactile learner - what I refer to as a "frisky friend." If this child is in your 2 or 3 year old class, odds are he/she is not going to “settle down” and become a bookworm during this school year. You will learn to treasure those rare moments of calm. You have to provide the child a way to be physical, in your classroom, safely. Because this is an active, busy, intense, "hard-to-land" kind of child, the best way to help him learn routines and consideration of others is to be active, busy, dramatic, visual, physical, and fun in your teaching. I particularly loved Christy Isbell's reference to some children being like "SUVs" (they run out of gas easily and need to be re-fueled) whereas others are "Hybrids" (seem to go with the flow, quietly and efficiently). Bottom line: we are all different; children have different learning styles; different children need different approaches, to help them learn and focus. As teachers, we have to respect all the different ways of learning in our class. - He arrives with a large ball and tosses it to me, I toss back, he tosses it to me, I toss back, he roars with laughter and runs away. - Throws ball across tower that friend is creating. - Let's build a train track? No, let's throw train track pieces. - Let's jump. Up and down, up and down, up and down. - Over to playdough - grabs pieces from friend. - Water table - not only splash it out of table, but let's drink from the table. - Pendulums above science table - let's climb up on top of table and pull/grab those pendulums down. - Let's throw fidget toys. - Let's kick off shoes and grab off socks. - Let's dump out kitchen toys, onto floor. - Let's jump on bean bag. - "Go away!" he screams to friends. He wants the bean bag to himself. His friends move away. Nothing he has done particularly surprises me, I am used to expecting the unexpected from him. We begin the year together with their ages ranging from 30- 42 months of age. These are very little persons, rather “new” persons! This I know for sure: I am going to have movers, shakers, "hard-to-land," intense little friends. Welcome the child. Help him/her discover the love of learning. We can really push ourselves to think outside the box, stretch for something new to offer this unique being. Put yourself in the child’s shoes. Imagine being the child. Allow the child to have a warm and responsive relationship with you! Shower them with love, affection, and positive interest. - His next breath is a gentle voice, "Ms. Maureen, will you read me this?" It is The Boy Who Wouldn't Share. We settle into the cozy chair and read. Learn to smile at the simple ironies of your day - here you are sitting cozy and comfy with your frisky friend and many of his classmates, reading a book about learning to be a friend. Usually I have to search for the special way to bring calm and order to the morning, but, today, he has found the key. What about open-ended, exploratory learning? Over the weekend, Bryce (age 14) got a new pair of shoes that came with two pairs of laces. Knowing my love for "extras," he offered a set of laces to me - and I immediately thought "Oh, yes! Pendulums!" Back in November, at the NAEYC Conference, Bev Bos and Michael Leeman had planted the seed for this idea...I just hadn't executed it yet. I found two wiffle balls in our basement and connected one shoelace to each - instant pendulums. 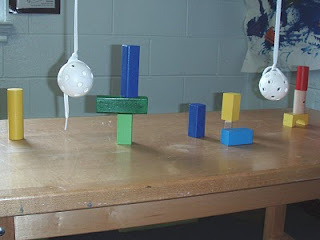 At school, I set them up over the science table, hanging from the ceiling, attached at the top by pipe-cleaners. To set the scene, I created a few small block structures on the table - "leading the witness," an attorney might say. Several years back, my then colleague Lynn told me that teaching preschool was a lot like throwing a rowdy dinner party. The teacher is the hostess: you set everything up, make it look nice and inviting, rush around at the last minute, put on a big smile for the door, and, once the company comes, you are on autopilot, fingers crossed that the guests will find the party as compelling as you had planned, and, guaranteed, all sorts of antics will ensue. For me, there is an energetic rush to this - I never know exactly what to expect on any given day, except for time to pass in a blur. I love to set up open-ended, exploratory fun. I like children to "investigate" in my room - to find new materials in the classroom each day and to consider what can be done with them. I have the most fun watching children be engaged in play, figuring things out, cause and effect. Our first experience with pendulums was so rewarding for me and the children. The science table was surrounded by ten children within minutes of its unveiling. Often with my open-ended, exploratory ideas, I don't give any rules up front, but - with a couple frisky friends in mind - I stated "Just know one rule: you can't hang or swing from the strings -see, they are just shoelaces attached to pipecleaners." I grabbed my clipboard, but my notes could not keep pace with the fun. "Ms. Maureen, what are those balls doing there?" "Ha! Ha! It didn't hit! It didn't hit!" I explained, "Yes, yes, it went "around" the blocks, Zach, I think 5 times - 1, 2, 3, 4 5!" "No, Ms. Maureen, 500 times!" I interjected, " Perhaps we need to wear our construction helmets?" "Build it again, we need to build it again!" "Mine didn't fall! It stayed!" Honestly, the children played over and over with the pendulums, for some 40 minutes of freeplay time. Two little boys never left the science table's side that day. Thinking about it afterwards, I was stunned by how little I had to say or intervene. The children themselves figured out the best sharing routine - two pendulums, up to 10 kids at one point - the child who built a tower got to release a pendulum, then he passed the pendulum ball to the friend to his side to do the same. I shook my head at the wonder, the marvel of this sharing - no bickering, no tears, everyone engaged and laughing. I ended this preschool "dinner party" full of energy, a gift from the children - seeing them so engaged in play.